CSUN biology professor MariaElena Zavala (left) is seen here working with students in the MARC program. Photo by Lee Choo. California State University, Northridge biology professor MariaElena Zavala has been named the first Latina Fellow of the American Society of Cell Biology (ASCB) in its 57-year history. The ASCB is an international community of biologists studying the cell, the fundamental unit of life. Its members are dedicated to advancing scientific discovery, advocating sound research policies, improving education, promoting professional development and increasing diversity in the scientific workforce. Zavala said she is honored to be named an ASCB Fellow. In addition to being a Fellow of the American Society of Cell Biology, she is also a Fellow of the American Association for the Advancement of Science (AAAS) and, last year, became the first Latina Fellow of the American Society of Plant Biologists (ASPB). 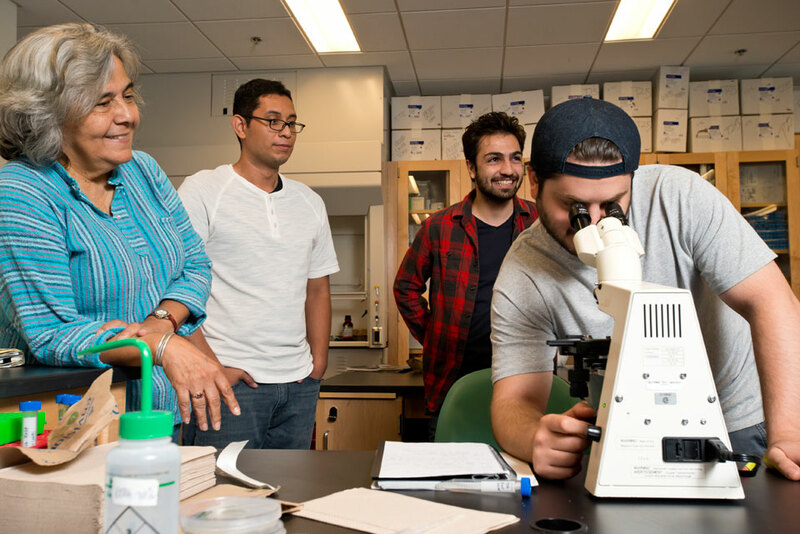 Zavala, who has taught at CSUN since 1988, is the first Mexican-American woman in the country to earn a Ph.D. in botany. Since coming to the campus, she has played an integral part in building the national reputation of CSUN’s Department of Biology as a place where students, particularly those from underserved communities, thrive and successfully pursue advanced degrees at top-tier research institutions. She has served as director of CSUN’s Maximizing Access to Research Careers Undergrad Student Training and in Academic Research (MARC U-STAR) program since 1990 and Research Initiatives for Scientific Enhancement (RISE) since 1993. Her work as a mentor and advocate for countless students who have gone through these programs earned her recognition from the White House. In 2000, Zavala received the Presidential Award for Excellence in Science, Mathematics and Engineering Mentoring from former President Bill Clinton. Zavala’s research focuses on the manipulation of genes as a way to improve plant productivity by enhancing root growth. She also is studying ways to make beans more nutritious.